April is officially Garden Month and to celebrate we've handpicked 10 of our bestselling garden themed gifts. Over the past few years there's been a growing trend for outdoor living. Even here in the UK we've been able to enjoy our gardens more over the past few years as we've welcomed particularly warm weather over the summer months. As we spend more time in our outdoor spaces it becomes second nature to want to improve and enhance them and one of the easiest and most affordable ways to do this is with garden accessories and decorations. Below we've listed 10 of our bestselling products for decorating gardens or gifting to green-thumbed hobbyists. Whether your business is a garden centre, a boutique high street shop or you're an online retailer, we hope this list inspires you with ideas for what your customers will be looking for in the upcoming season. 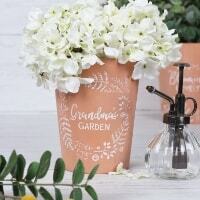 Our exclusive Botanical Mum collection features a selection of terracotta plant pots and hanging signs. Terracotta is a timeless material which compliments any garden design and ages beautifully for a rustic effect. This collection has a contemporary twist which is an elegant floral and leaf pattern. The plant mister shown in the image is also available. Perfect for adding a touch of zen to outdoor spaces, we offer a range of garden buddha ornaments in several sizes, colours and designs. 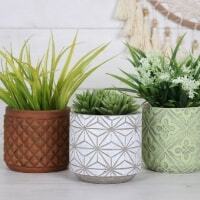 These patterned plant pots will instantly add style to any outdoor area. Made from cement, they're hardy and will withstand the elements for years to come. All of our suncatchers are ethically sourced and provide an easy way to brighten up a garden, window or conservatory. We have three exclusive collections including British Butterflies, British Birds and Daisy Picking which are all available in singles or retail display sets. In addition to these, we also have a diverse range of other designs available. These charming flower pot men bestsellers are full of character. There are three different designs available including an option which doubles as a flower planter. Willy the Worm is a product which always raises eyebrows and is an excellent talking point and spontaneous add-on item. Designed to be inserted into the soil next to plants and flowers, Willy is made from terracotta so will turn darker when the soil is full of moisture and will lighten when the soil starts to dry out indicating that it's time to water the plants. Practical as well as pretty, this mint green watering can is an essential item for keeping any garden hydrated during dry spells in the weather. Perfect for homes with plenty of outdoor space, this slate garden sign helps point guests in the right direction. This item would be great for hotels and guest houses wanting to encourage guests to enjoy the garden spaces. A thoughtful gift idea for any keen vegetable gardener, these smooth stones help to mark and identify what's planted where in the vegetable garden. The stones come in a retail display box and each stone is sold separately so your customers can choose those which they need from the selection. Each stone comes with a small pouch - perfect for gift giving. At Something Different we're known for our windchimes which represent excellent quality and variety at competitive prices. We stock over 135 designs all of which have been ethically sourced. Our range includes bamboo and metal styles as well as exclusive designs developed by our in house creative team. We hope you enjoyed reading about our top 10 choices for the garden. If you have any questions about our products let us know in the comments below or send us a message on our live chat, we'd be happy to help.